There are two kinds of people in this world: Those who can press the crosswalk button once and wait politely for the light to change, and people who mash the thing like they’re playing Mortal Kombat. As far as I’m concerned, only one is correct. When I find myself standing at a crosswalk, I attack the To Cross Push Button with the savagery of an overweight eight grader running down a corner piece of cake at a birthday party. I’ve noticed a lot of other people do that too, and I’m pretty sure it indicates we’re free-thinking and socially well-adjusted individuals. I was very disturbed to recently learn that my own wife only pushes the button one time, trusting the light to heeded a single request to change. I think this is weird, freaky and deeply wrong. What else is she trusting the machines to take care of for her? Obviously, the rest of us know no crosswalk light is going to bother changing for less than 5 or 600 pushes. It’s not going to do jack if you don’t articulate a sense of urgency to it. I’m pretty sure this line of reasoning qualifies me as being Regular and Normal. As for you single-pushers, I don’t know. You’ve got me worried. I don’t actually care how many times you push the crosswalk button, but I do wonder if the prevailing majority are hyper-pushers, as I hypothesize. 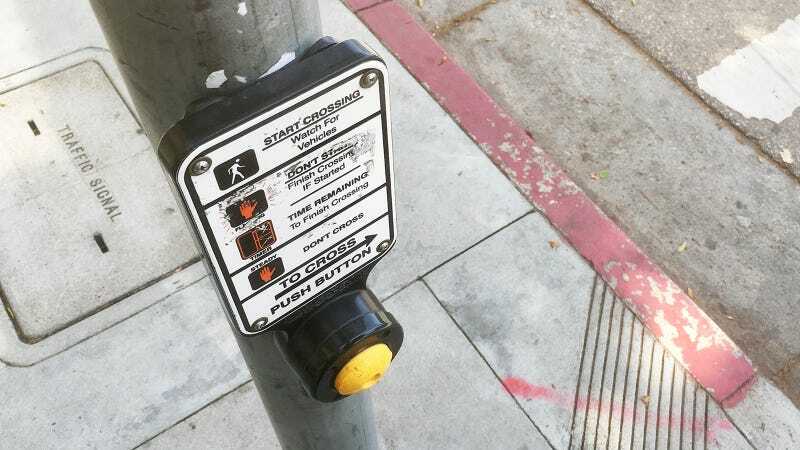 So tell me–can you stay calm after one push or do you mercilessly wail on the button until it’s your turn to cross the street?